James Keller, Director of the Pioneering area at the 2013 National Jamboree, related a story about the Japanese Mark II Square Lashing. He described how back in 1993, Adolph Peschke had mandated that his staff should just use the Japanese Mark II Square Lashing for the national jamboree’s pioneering projects. Some of the Pioneering staff back then had not as of yet become familiar with the lashing, and at first, some were a little hesitant to adopt it. But, after becoming acquainted, their overwhelming consensus was, why had they wasted so much time over the years using the traditional Square Lashing. The Japanese Mark II Square Lashing has found its way into Scouting in the United States through Wood Badge training in England, and because of the work of John Thurman, camp chief of Gilwell. He observed it on one of his many world trips related to Wood Badge training. This lashing is a straightforward approach to the task of lashing two spars together. Begin by placing the spars in the desired position. Now fold your lashing rope in half. The midpoint of the rope is placed around the vertical spar and just under the crossing spar (see figure 108). Now work both ends of the rope at the same time to make three wraps around the spars (see figure 109). After completing the three wraps, bring the two ends up between the spars in opposite directions to make the frapping turns around the wraps (see figure 110). 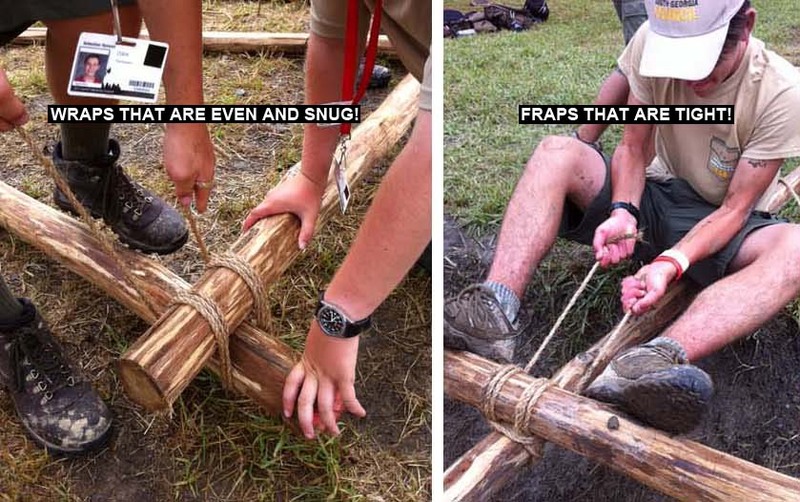 Pull the frapping turns tight, and complete the lashing by tying the two ends with a Square Knot (see figure 111). It’s that simple. The advantage of this lashing is that you’re working both ends of the rope at the same time. This makes it much quicker to tie since each hand has less rope to pull through. This lashing has the same holding effect as both the traditional and modified Square Lashings. If more support is needed for the crossing spar, a Clove Hitch can be tied at the midpoint of the rope. Tie the Clove Hitch to the vertical spar just below the crossing spar. You can rest the crossing spar on the Clove Hitch as the lashing is being made. Then use both ends to complete the lashing as described above. View Video on How and Why to Tie the Japanese Mark II Square Lashing.